Through weekly one-on-one visits, we facilitate friendships that bring out the beauty of the person still present. Connecting with an Alzheimer's Buddy teaches students the fundamentals about being human, fragility and strength, and the value of others. In this video, Allison speaks about her friendship with Dorothy during the Alzheimer's Buddies family and student luncheon. "I love spending time with my buddy and learning about her past. She is a remarkable woman...who teaches me so much about life and brightens my day each time I visit her. I hope that I can have a fraction of the amount of impact on her life as she does in mine." 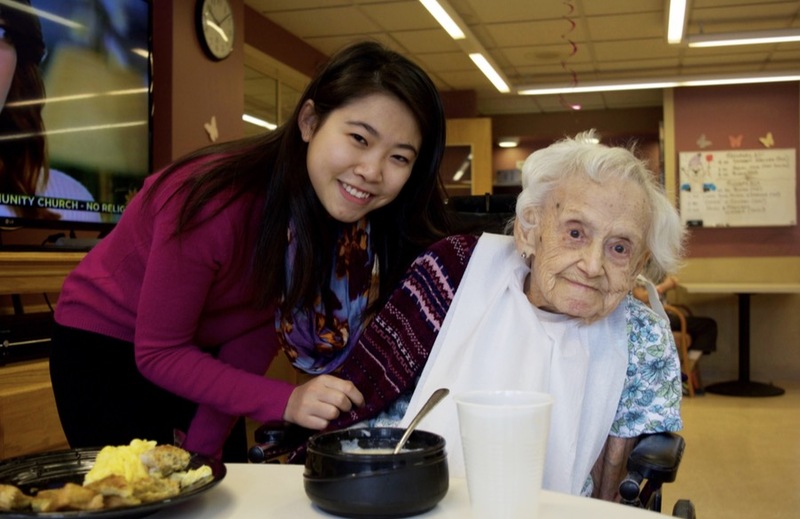 "For me, the Alzheimer's Buddies program has been one of the many unanticipated opportunities since coming to college for me to positively influence the people around me and, in turn, be positively impacted by those people as well." "For me, Pearl has taught me how to appreciate the things around me, value both big and small interactions with others, and treasure the time I have with those I love." "It is amazing what can happen when two people devote just one hour a week to being together. The time I spent with B. was a privilege and I still think of him often. I remember playing Bingo together and saving up our winnings to go on a cruise. At $1.25 we probably still have a ways to go before we can afford an all inclusive, but I always smile when I think of the woman sitting across from us who asked Byron if I was his granddaughter. He very politely said, "No. She's my friend." Then we smiled at one another and looked for B25. I'm not sure if we won that round, but I remember feeling pretty incredible sitting beside my friend in that moment." "B. and I became close friends as soon as I joined Alzheimer's Buddies. We connected on the first day of introductions when B. mentioned that her favorite movie was a 1942 classic- 'Now, Voyager'- my favorite movie as well. From then on we met weekly and talked about their lives and, of course, our shared interest in cinema. Every time I came to see B., she lights up and we share a hug. She is the funniest, sweetest lady I know. Bertha has given me so many intangible life lessons from our conversations on Sundays."